At Black Rok, we have plenty to offer you with regards to kitchen lighting ideas. The introduction of LEDs have proved immensely popular with our customers. Most of our clients now ask for some form of additional lighting in the form of LEDs, often in the form of LED strips. 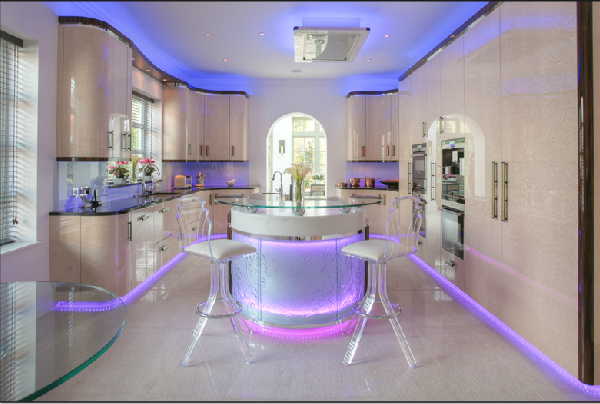 Of course the beauty of the LED is that they are energy efficient, and have tremendous flexibility in positioning: under worktops, over-worktops, above plinths, behind glass shelves; often, the only limit is the imagination. They are also extremely versatile, providing functional lighting, accent or decorative lighting. 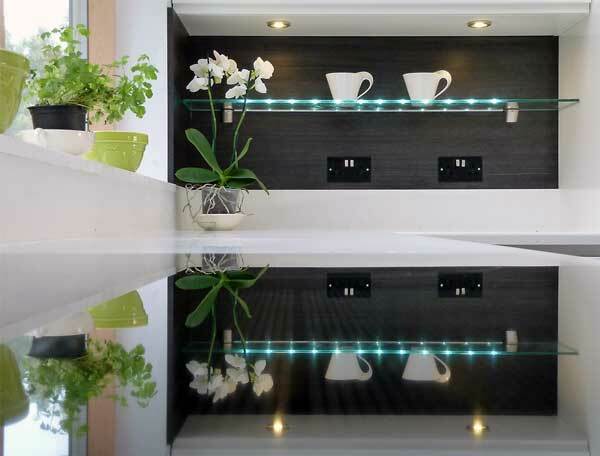 LED strips also offer discreet lighting: lights that are not seen until they are switched on. And when they are switched on the effects can be literally sparkling. The gloss surfaces of many kitchen parts — from door fronts to hobs — mean that the lighting is seen not just at it’s source but also at numerous other points. It takes a creative imagination to make the most of the options available for kitchen lighting, and it’s really worthwhile to give plenty of thought to how you want your lighting to enhance your kitchen. Do you want certain locations brighter for working at? Are there design aspects that can be emphasised with some subtle lighting additions? It’s also vital to make all these plans early on in the design stage so that power can be provided in the necessary locations. Of course, it is possible to have too much of a good thing. We think that this design below is maybe one step too far down the road of creative kitchen lighting; what do you think? Remember, at Black Rok we build kitchens to last, and what looks great on paper might get a little tiresome to live with day after day. Of course, beauty remains in the eye of the beholder, and with today’s technology lighting our kitchens, almost anything is possible.